ecently, I had a chance to see the film, The Post. In addition to brilliant acting and inspiring storytelling, one scene made me catch my breath: as Post owner Katharine Graham weighed her decision to print or not to print the story that could destroy her paper, typesetters and press operators raced to compose the pages and ready the presses. It was so vivid, I could smell oil and ink. “That’s real,” I whispered. I blinked away tears. It turns out I wasn’t the only one riveted by what that scene meant. I checked with a Facebook group I joined awhile back—Lovers of Letterpress. Shortly after, group member Michael Sharp shared this link to a story about how authentic props and technical advice were provided by the Museum of Printing in Haverhill, MA. Then Davin Brook Kuntze spoke up. Our shop (Woodside Press) stood in for the composing rooms. 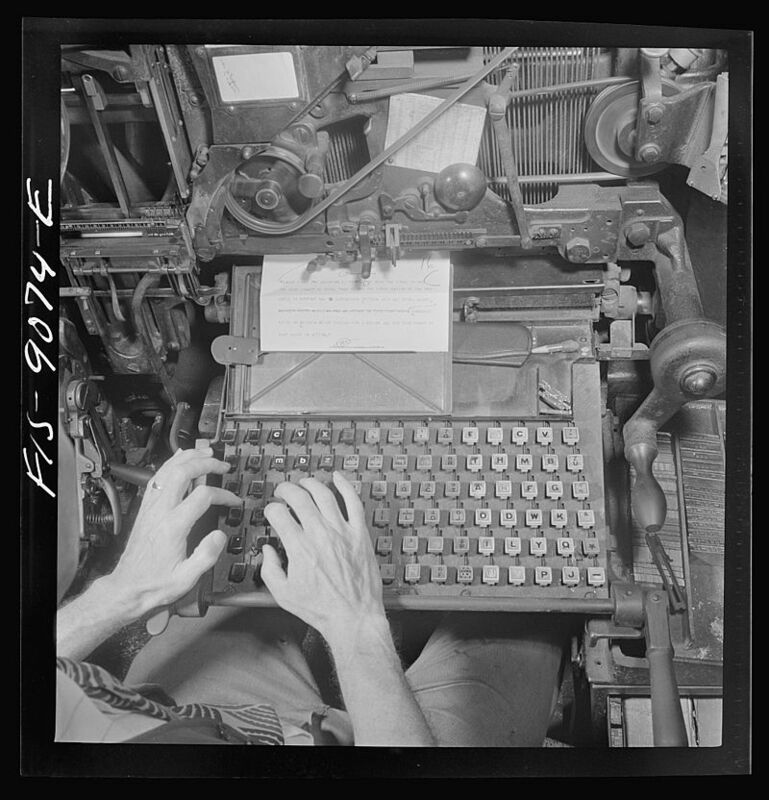 So all the Linotype shots are from our machines, usually with my hands in frame or at least just off camera in case something goes “squirt”. I also built the two WaPo front page props as closely as I could (given the timeline and budget) to how they were done in 1971, five years before I was actually born. Frank Romano at the Museum of Printing provided a lot of history and some items we didn’t have, like the massive chases to lock up the forms. The two finished front pages. 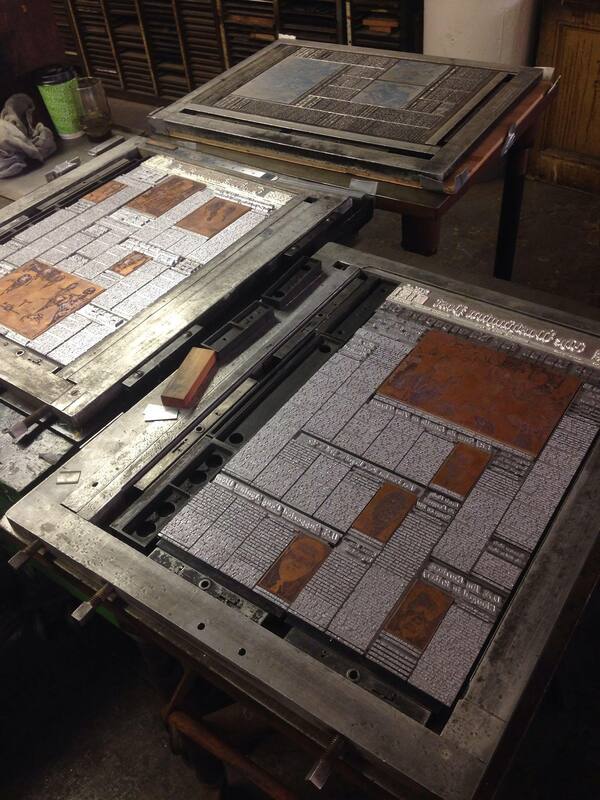 Cast entirely on our Blue Streak Comet in 9pt Caledonia and Ludlow Bodoni for the subheads. The headline which you can see being set by hand briefly in the film (“Court Rules …”) is 72pt Bodoni Bold cast by Rich Hopkins down in West Virginia. I cheated the WaPo banner with a magnesium plate from a scan. It got dirtied up and wasn’t really visible in any scenes. As far as I know, all the press room scenes (with the big web presses) were shot up at the New York Post printing facilities in the Bronx. The third form in the background is an original New York Times form from the mid-70s, on loan from The Museum of Printing. Here’s a little fun gossip: My friend Marc helped out as an extra for the film. He’s been around the shop for a decade or more and has done printing and typesetting and basically could pull off looking like he knows what he’s doing in the background. He was tapped to sit at the “hero machine” (which was our Blue Streak Comet) on the second day. He’s never actually run a Linotype although he’s watched me do hundreds of times. An hour or two into the shoot and we get the call from Steven that he needs the machine to be operational in the next scene they want to shoot. So Marc got a five minute crash course from me while they set up the cameras and then run a Linotype … for the very first time in his entire life … with Meryl Streep leaning over his shoulder and Steven Spielberg telling him how to do it. My first time on the machine was a breeze by comparison. For the last year or so I’ve had a shop devil-apprentice joining me in my shop, sharing my hobby and learning the joys of letterpress. She just turned 16 last week. A few weeks ago we went to see the Post. Of course being so young she had very little knowledge of Vietnam, the Pentagon Papers, JFK, LBJ, Watergate, or Nixon. Prior to seeing the movie I gave her a quick primer on our history in/re Vietnam. Having been a teenager in the 60s, (Draft Card, Protests, Woodstock, friends in Nam, et al) I was well qualified to give her this lesson. In the movie when Katherine Graham says, “we print” and the scene moves to the composing room, I was crying for joy for Freedom of the Press. More importantly, I was crying for joy as my apprentice was clapping her hands together in joy for all the equipment she recognized and had been playing with for the past year. More importantly, I was crying that she appreciated the tie-in between what we do—print—and the importance of a FREE PRESS. But most importantly, a lesson this young “dreamer” was learning about what our country is really about. If you can’t get enough of this behind-the-scenes story, click on any of the pictures below to see them bigger, along with extra notes. Left and right arrows will allow you to scroll through the entire set. Test fitting the type next to a repro of the original. Photo by Davin Kuntze. La-di-la-di-dah … cutting and fitting! Photo (and caption 🙂 by Davin Kuntze. Almost there… Photo by Davin Kuntze. Framing in progress. Photo by Davin Kuntze. And packed! Photo by Davin Kuntze. Nevermind what’s-his-name in the foreground… That’s Davin in the back right, and Andrew Birsh (owner of Woodside Press) is standing across from him. They’re pretending to set type. Davin liked this great tweet and included it with the photos he sent.